head? And don’t Golden Eagles only live in the western US? Well, yes and no. If you use just these two parameters in your ID, you will likely be right most of the time. But Bald Eagles don’t get white head feathers until they are adults. So, before they are around five years old, they don’t look a lot like what most of us think of as a Bald Eagle. If you see an eagle-sized bird that is brown all over, this might be either a Golden or juvenile Bald Eagle. So, how to determine which one it is? 1 – Take a look at the head and beak. If the head looks large and the bill appears massive, this is likely a juvenile Bald Eagle. 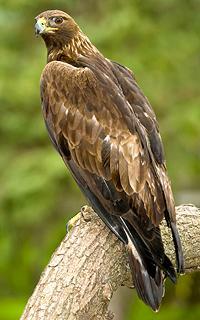 2 – Golden Eagles, especially juveniles, are less bulky overall than Bald Eagles. 3 – If the bird is soaring, take a look at the wings. If they are completely straight across, you are looking at a Bald Eagle; if there is a slight angle or “v” in the wings, this is a Golden Eagle. Still not sure? 4 – Their feeding habits may help narrow it down even further. If you see the bird perched near water, it may be more likely a fish-loving Bald Eagle. Golden Eagles are partial to open and hilly areas where they can find rabbits, squirrels and other small mammals. Even though they will also catch fish, small mammals are the preferred fare. And yes, if you are in the eastern part of the US, the likelihood is the bird is a Bald Eagle, as Golden Eagles are fairly rare in the eastern US. Regardless of which North American eagle you see, it will be easy to tell the difference between them and any other raptor, as eagles are, well, just a lot bigger than everybody else! If it is still freezing where you live, make a trip out to where there is some open water, and you may be able to see a few if not a lot, of Bald Eagles perched nearby, just waiting for a fish to swim within range. Another joy of winter birding!